Optimizing the parameters of a trading strategy via backtesting has one major problem: there are typically not enough historical trades to achieve statistical significance. Whatever optimal parameters one found are likely to suffer from data snooping bias, and there may be nothing optimal about them in the out-of-sample period. That's why parameter optimization of trading strategies often adds no value. On the other hand, optimizing the parameters of a time series model (such as a maximum likelihood fit to an autoregressive or GARCH model) is more robust, since the input data are prices, not trades, and we have plenty of prices. 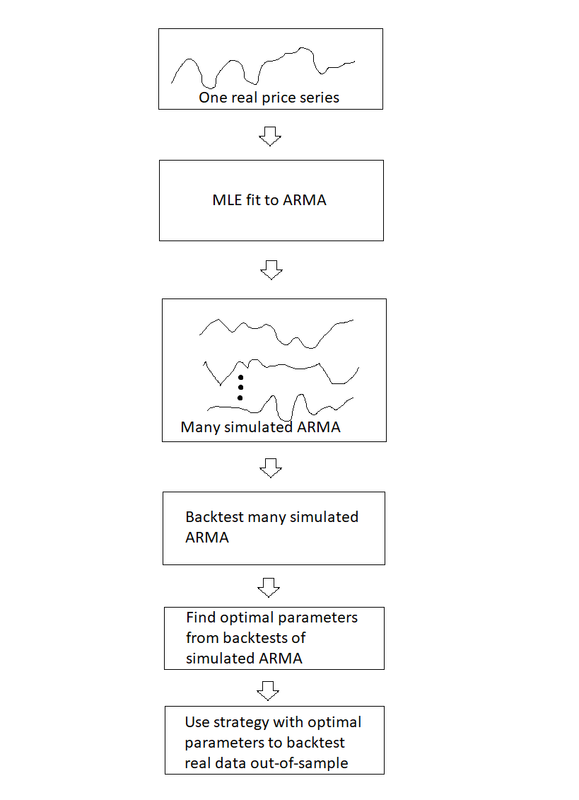 Fortunately, it turns out that there are clever ways to take advantage of the ease of optimizing time series models in order to optimize parameters of a trading strategy. One elegant way to optimize a trading strategy is to utilize the methods of stochastic optimal control theory - elegant, that is, if you are mathematically sophisticated and able to analytically solve the Hamilton-Jacobi-Bellman (HJB) equation (see Cartea et al.) Even then, this will only work when the underlying time series is a well-known one, such as the continuous Ornstein-Uhlenbeck (OU) process that underlies all mean reverting price series. This OU process is neatly represented by a stochastic differential equation. Furthermore, the HJB equations can typically be solved exactly only if the objective function is of a simple form, such as a linear function. If your price series happens to be neatly represented by an OU process, and your objective is profit maximization which happens to be a linear function of the price series, then stochastic optimal control theory will give you the analytically optimal trading strategy: with exact entry and exit thresholds given as functions of the parameters of the OU process. 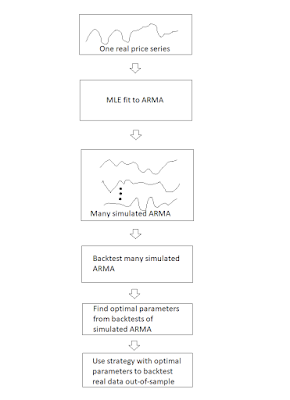 There is no more need to find such optimal thresholds by trial and error during a tedious backtest process, a process that invites overfitting to sparse number of trades. As we indicated above, the parameters of the OU process can be fitted quite robustly to prices, and in fact there is an analytical maximum likelihood solution to this fit given in Leung et. al. But what if you want something more sophisticated than the OU process to model your price series or require a more sophisticated objective function? 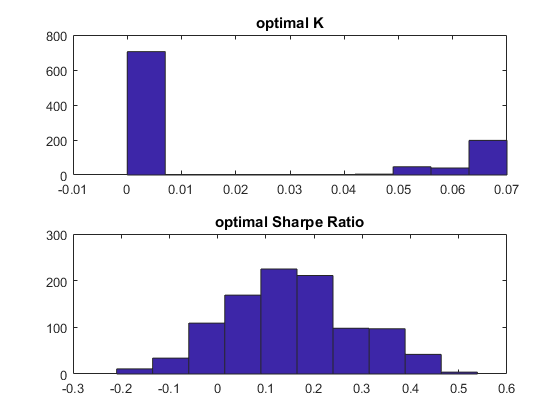 What if, for example, you want to include a GARCH model to deal with time-varying volatility and optimize the Sharpe ratio instead? In many such cases, there is no representation as a continuous stochastic differential equation, and thus there is no HJB equation to solve. Fortunately, there is still a way to optimize without overfitting. Here is a somewhat trivial example of this procedure. 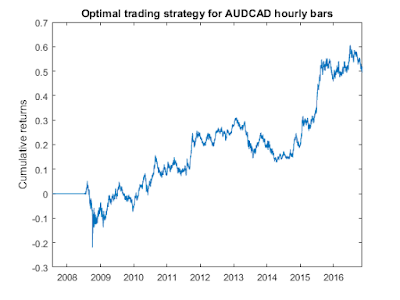 We want to find an optimal strategy that trades AUDCAD on an hourly basis. First, we fit a AR(1)+GARCH(1,1) model to the data using log midprices. The maximum likelihood fit is done using a one-year moving window of historical prices, and the model is refitted every month. We use MATLAB's Econometrics Toolbox for this fit. Once the sequence of monthly models are found, we can use them to predict both the log midprice at the end of the hourly bars, as well as the expected variance of log returns. 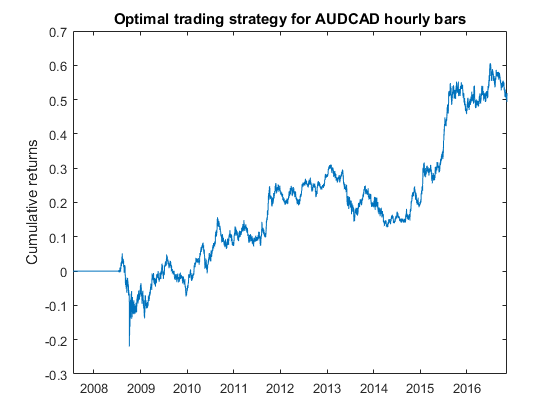 So a simple trading strategy can be tested: if the expected log return in the next bar is higher than K times the expected volatility (square root of variance) of log returns, buy AUDCAD and hold for one bar, and vice versa for shorts. But what is the optimal K? You may exclaim: "This can't be optimal, because I am able to trade AUDCAD hourly bars with much better returns and Sharpe ratio!" Of course, optimal in this case only means optimal within a certain universe of strategies, and assuming an underlying AR(1)+GARCH(1, 1) price series model. Our universe of strategies is a pretty simplistic one: just buy or sell based on whether the expected return exceeds a multiple of the expected volatility. But this procedure can be extended to whatever price series model you assume, and whatever universe of strategies you can come up with. In every case, it greatly reduces the chance of overfitting. P.S. we invented this procedure for our own use a few months ago, borrowing similar ideas from Dr. Ng’s computational research in condensed matter physics systems (see Ng et al here or here). But later on, we found that a similar procedure has already been described in a paper by Carr et al. About the authors: Ernest Chan is the managing member of QTS Capital Management, LLC. Ray Ng is a quantitative strategist at QTS. He received his Ph.D. in theoretical condensed matter physics from McMaster University. I will be moderating this online workshop for Nick Kirk, a noted cryptocurrency trader and fund manager, who taught this widely acclaimed course here and at CQF in London. This online course focuses on backtesting intraday and portfolio option strategies. No pesky options pricing theories will be discussed, as the emphasis is on arbitrage trading.